The personal report that begins below, first appeared in the website, Mondoweiss. This report conveys the horror of war experienced by young Palestinian college students in Gaza during recent summer weeks of unrelenting and vicious attacks by Israel. As all academics in Gaza, I had given much thought to my students who were suffering all sorts of agonies and worries caused by Israel’s aggression. After 40 days of atrocities caused by heavy bombardment and random artillery shelling, which destroyed thousands of houses and devastated countless families, the Islamic University of Gaza (IUG) did everything it could to make use of the three-day temporary ceasefire, which was extended for five days and then for another 24-hour period before it ended at midnight on August 19th, 2014. They decided to resume the classes on Saturday, August 16 that had so crudely interrupted summer semester. I was unsure what to say to my students in my lecture class. Many agonizing questions occupied my mind, among them: Were all my students and their families safe or were any of them injured or maimed? Would they be mentally able to come to class? Were they still living at home, or displaced in some shelter? How did they feel about resuming class in the midst of such agony and grief? What tragedies had each of my students been through and how much were they comfortable talking about? Overwhelmed by these concerns and well aware of the deep wounds, loss, and hardship every single Palestinian in Gaza has suffered, I was not able to enter the classroom with a big smile on my face as I had always done in the past. In a broken voice, struggling to breathe normally, Naji began narrating his own tragedy. Quietly, his eyes became heavy with tears and the words stuck in his throat. A few seconds later, he continued narrating his story of loss. “Khalid is one of my best friends, and the best of our project team. Khalid can never be forgotten; he has an amazing personality full of fun and life and energy. He is a fantastic and lovable friend and friendly to everyone. “About two weeks after the attacks had started and during the most extreme atrocities in Shujai’iya on 20 July, I was listening to the news on the radio when I suddenly learned that Khalid had been killed when an Israeli rocket hit his house around midnight. His 55 year old father was buried under the rubble and severely injured his spine. To read the entire report from Professor Al-Masri, click here. An older Jewish generation, survivors, and descendents of survivors from the Holocaust, have raised their voices over Israel’s “massacre of Palestinians in Gaza”. Hundreds of Holocaust survivors and descendants of survivors have signed a letter, published as an advertisement in Saturday’s New York Times, condemning “the massacre of Palestinians in Gaza” and calling for a complete boycott of Israel. According to the letter, the condemnation was prompted by an advertisement written by Elie Wiesel and published in major news outlets worldwide, accusing Hamas of “child sacrifice” and comparing the group to the Nazis. “…we are disgusted and outraged by Elie Wiesel’s abuse of our history in these pages to justify the unjustifiable: Israel’s wholesale effort to destroy Gaza and the murder of more than 2,000 Palestinians, including many hundreds of children. Palestinian college students and Holocaust survivors, and descendants of Holocaust survivors, share a common sense of outrage and sadness over Israel’s massacre. Does the American media hear these cries of anger and anguish? Do American religious leaders, the secular political leaders, and the American public hear what is happening in Gaza? Clearly they do not, because they all remain silent. 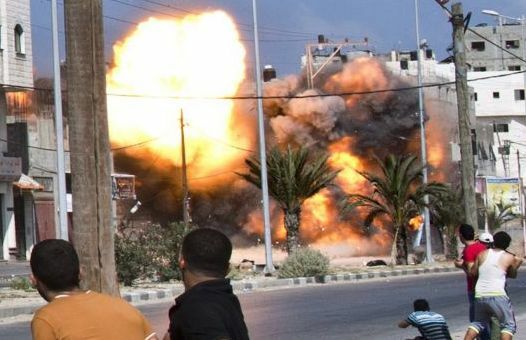 In the AFP picture above a bomb strikes a building in Gaza City August 24. This entry was posted in Human Rights, The Human Condition, Uncategorized, War. Bookmark the permalink. An incredibly compelling and heartrending piece Jim, thank you for giving voice to those are often silenced. I will be sharing my personal experience of the Palestinians next month, 20 years after writing a book about them. “Bringing It All Home” is the title of my talk, referring to the home I have finally found back in a Lutheran congregation I left for the Anglicans during my 22-year marriage. I will focus on “the ordinary”and how my several years intimate involvement with an activist refugee family in Deheishe Camp helped restore to me the “ordinary” (the “kitchen spoon”) which dropped out of my life with the early death of my father when I was a child. It was, and continues to be the ordinary, that the Palestinians have held on to for dear life–dancing, eating, joking, teasing, visiting, marrying, picking olives, having children, etc.–under a long and harsh occupation designed to make that ordinary life impossible. “We must ‘to live.” the older brother of a young martyr kept repeating to me. Write about “the human,” Nidal continued to advise me. And it is the ordinary once again that was under horrendous attack in Gaza–the homes, the universities, the hospitals, the little gardens, the side streets, all of those places that support the everyday. God bless Jane Austen and that English professor and those students, alive and dead! And God bless all pf our kitchen spoons! I struggle to find words to respond, Jim, and would prefer not to speak. But the final words of Professor Al-Masri compel us to find a way to convey this horror to our friends and neighbors. Thank you for bringing this before us. Thank you, Jim for giving exposure to what some of the brave young men and women are going through in Gaza. To me the US is like the vast forest and the destruction of Gaza is like the falling of a tree. Our mainstream media, have earplugs, or are not there to pick up the sound. Fortunately, there are Americans of conscience, like your good self, who make sure that sound is picked up and transmitted beyond the borders of Palestine.